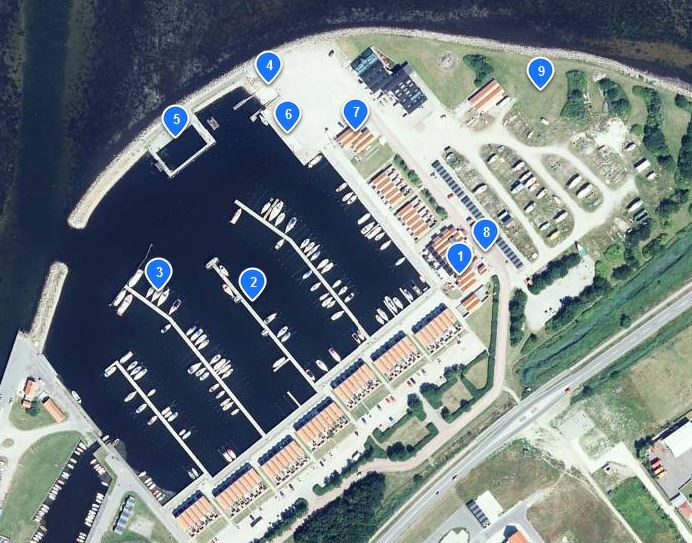 Harbour / Autocamper dues per 24 hour: DKK 120,- Electricity DKK 20,- Please use the payment machine at Harbour Masters office. Nibe was originally a fishing village, first mentioned in 13’th century. The rich herring fishery shaped the town up to app. 1828, where the herring disappeared. In 1727 Nibe formally became a Market Town. Well-preserved and beautiful old houses, winding streets and squares with paving stone – that is what you will find in the old part of town. The church of Nibe from 1440, is beautifully situated in the centre of the town and is definitely worth a visit. A – Classified (all year). Capacity – Number of boats = 220. Facilities: Bath/toilet/cooking/laundry facilities rebuild in 2009, Free wireless internet connection for our Guests and residents. Freshwater and electricity (CEE plug) on all bridges, slipway, mast crane, and restaurant / cafe / Ice cream sale. Dump Point for Autocamper at no. 6. Guest bridge – Guests are also welcome to use all berths marked with green signs.